Two new Links designed to support themes both new and old. • Add “Magical Musket” Spells and/or Traps with different names from your Deck to your hand, up to the number of monsters your opponent controls. • Special Summon “Magical Musket” monsters with different names from your Deck, up to the number of Spells and Traps your opponent controls. (2) During either player’s turn, you can activate “Magical Musket” Spells and Traps from your hand. 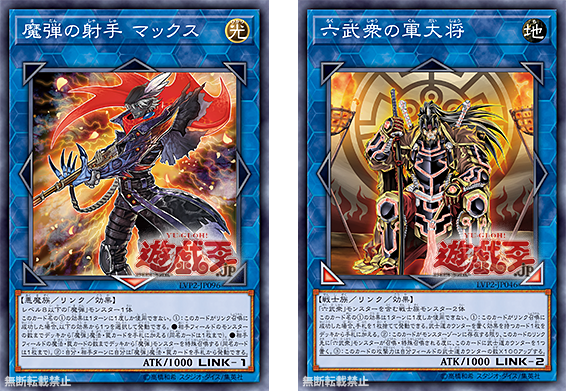 (1) If this card is Link Summoned: You can discard 1 card; add, from your Deck to your hand, 1 card that has an effect that places a Bushido Counter(s) on a card(s). (2) Each time a “Six Samurai” monster(s) is Normal/Special Summoned to a zone this card points to, place 1 Bushido Counter on this card. (3) Gains 100 ATK for each Bushido Counter on cards you control.